In biology, kingdom (Latin: regnum, pl. regna) is the second highest taxonomic rank below domain. Kingdoms are divided into smaller groups called phyla. Traditionally, textbooks from the United States used a system of six kingdoms (Animalia, Plantae, Fungi, Protista, Archaea/Archaeabacteria, and Bacteria/Eubacteria ) while textbooks in Great Britain, India, Australia, Latin America and other countries used five kingdoms (Animalia, Plantae, Fungi, Protoctista, and Prokaryota/Monera). Some recent classifications based on modern cladistics have explicitly abandoned the term "kingdom", noting that the traditional kingdoms are not monophyletic, i.e., do not consist of all the descendants of a common ancestor. When Carl Linnaeus introduced the rank-based system of nomenclature into biology, the highest rank was given the name "kingdom" and was followed by four other main or principal ranks: the class, order, genus and species. Later two further main ranks were introduced, making the sequence kingdom, phylum or division, class (biology), order, family, genus and species. In the 1960s a rank was introduced above kingdom, namely domain (or empire), so that kingdom is no longer the highest rank. Prefixes can be added so subkingdom and infrakingdom are the two ranks immediately below kingdom. Superkingdom may be considered as an equivalent of domain or empire or as an independent rank between kingdom and domain or subdomain. In some classification systems the additional rank branch (Latin: ramus) can be inserted between subkingdom and infrakingdom (e.g. Protostomia and Deuterostomia in the classification of Cavalier-Smith). A phylogenetic tree based on rRNA data showing Woese's three-domain system. All smaller branches can be considered kingdoms. From around the mid-1970s onwards, there was an increasing emphasis on comparisons of genes on the molecular level (initially monophyletic (all descendants of a common ancestor) or paraphyletic (only some descendants of a common ancestor). Based on such RNA studies, Carl Woese, thought life could be divided into three large divisions and referred to them as the "three primary kingdom" model or "urkingdom" model. In 1990, the name "domain" was proposed for the highest rank. Woese divided the prokaryotes (previously classified as the Kingdom Monera) into two groups, called Eubacteria and Archaebacteria or Archaea, stressing that there was as much genetic difference between these two groups as between either of them and all eukaryotes. According to genetic data, although eukaryote groups such as plants, fungi, and animals may look different, they are more closely related to each other than they are to either the Eubacteria or Archaea. It was also found that the eukaryotes are more closely related to the Archaea than they are to the Eubacteria. Although the primacy of the Eubacteria-Archaea divide has been questioned, it has been upheld by subsequent research. There is no consensus on how many kingdoms exist in the classification scheme proposed by Woese. How many kingdoms are present in the Eukarya? In 2004, a review article by Simpson and Roger noted that the Protista were "a grab-bag for all eukaryotes that are not animals, plants or fungi". They held that only monophyletic groups should be accepted as formal ranks in a classification and that, while this approach had been impractical previously (necessitating "literally dozens of eukaryotic ‘kingdoms’"), it had now become possible to divide the eukaryotes into "just a few major groups that are probably all monophyletic". On this basis, the diagram opposite (redrawn from their article) showed the real 'kingdoms' (their quotation marks) of the eukaryotes. A classification which followed this approach was produced in 2005 for the International Society of Protistologists, by a committee which "worked in collaboration with specialists from many societies". It divided the eukaryotes into the same six "supergroups". The published classification deliberately did not use formal taxonomic ranks, including that of "kingdom". Opisthokonta — animals, fungi, choanoflagellates, etc. In this system the multicellular animals (Metazoa) are descended from the same ancestor as the unicellular choanoflagellates and the fungi which form the Opisthokonta. Plants are thought to be more distantly related to animals and fungi. However, in the same year as the International Society of Protistologists' classification was published (2005), doubts were being expressed as to whether some of these supergroups were monophyletic, particularly the Chromalveolata, and a review in 2006 noted the lack of evidence for several of the supposed six supergroups. The classification of living things into animals and plants is an ancient one. Aristotle (384–322 BC) classified animal species in his History of Animals, while his pupil Theophrastus (c. 371–c. 287 BC) wrote a parallel work, the Historia Plantarum, on plants. Carolus Linnaeus (1707–1778) laid the foundations for modern biological nomenclature, now regulated by the Nomenclature Codes, in 1735. He distinguished two kingdoms of living things: Regnum Animale ('animal kingdom') and Regnum Vegetabile ('vegetable kingdom', for plants). Linnaeus also included minerals in his classification system, placing them in a third kingdom, Regnum Lapideum. In 1674, Antonie van Leeuwenhoek, often called the "father of microscopy", sent the Royal Society of London a copy of his first observations of microscopic single-celled organisms. Until then, the existence of such microscopic organisms was entirely unknown. Despite this, Linnaeus did not include any microscopic creatures in his original taxonomy. ^ a b Linnaeus, C. (1735). Systemae Naturae, sive regna tria naturae, systematics proposita per classes, ordines, genera & species. ^ Cavalier-Smith, Thomas (March 26, 1987). "Eucaryotes with no mitochondria". Nature 326 (6111): 332–333. ^ Moreira, David; Purificación López-García (2009). "Ten reasons to exclude viruses from the tree of life". Nature Reviews Microbiology 7 (4): 306–311. ^ Hegde, Nagendra; Mohan S. Maddur, Srini V. Kaveri & Jagadeesh Bayry (2009). "Reasons to include viruses in the tree of life". Nature Reviews Microbiology 7 (8): 615. ^ Raoult, Didier; Stéphane Audic, Catherine Robert, Chantal Abergel, Patricia Renesto, Hiroyuki Ogata, Bernard La Scola, Marie Suzan, Jean-Michel Claverie (2004). "The 1.2-Megabase Genome Sequence of Mimivirus". Science 306 (5700): 1344–1350. ^ Copeland, H. (1938). "The kingdoms of organisms". Quarterly Review of Biology 13: 383–420. ^ Woese, C. R.; Fox, G. E. (November 1977). "Phylogenetic structure of the prokaryotic domain: the primary kingdoms". Proceedings of the National Academy of Sciences of the United States of America 74 (11): 5088–90. ^ Cavalier-Smith, T. (1981). "Eukaryote kingdoms: seven or nine?". Bio Systems 14 (3–4): 461–481. ^ Cavalier-Smith, T. (1992). "Origins of secondary metabolism". Ciba Foundation symposium 171: 64–80; discussion 80–7. ^ Cavalier-Smith, T. (1993). "Kingdom protozoa and its 18 phyla". Microbiological reviews 57 (4): 953–994. ^ Cavalier-Smith T (June 2010). "Kingdoms Protozoa and Chromista and the eozoan root of the eukaryotic tree". Biol. Lett. 6 (3): 342–5. There is no current consensus on how many kingdoms are present in the Eukarya. In 2009, Andrew Roger and Alastair Simpson emphasized the need for diligence in analyzing new discoveries: "With the current pace of change in our understanding of the eukaryote tree of life, we should proceed with caution." The kingdom-level classification of life is still widely employed as a useful way of grouping organisms. A summary of the different kinds of proposed classification schemes presented in this article is summarized in the table below. There is ongoing debate as to whether viruses, obligate intracellular parasites that are not capable of replication outside of a host, can be included in the tree of life. A principal reason for inclusion comes from the discovery of unusually large and complex viruses, such as Mimivirus, that possess typical cellular genes. 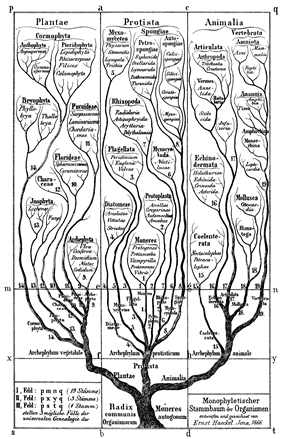 The diagram below does not represent an evolutionary tree. In the same way, his paraphyletic kingdom Protozoa includes the ancestors of Animalia, Fungi, Plantae and Chromista. The advances of phylogenetic studies allowed Cavalier-Smith to realize that all the phyla thought to be hydrogenosomes. This means that all living eukaryotes are in fact metakaryotes, according to the significance of the term given by Cavalier-Smith. Some of the members of the defunct kingdom Archezoa, like the phylum Microsporidia, were reclassified into kingdom Fungi. Others were reclassified in kingdom Protozoa like Metamonada which is now part of infrakingdom Excavata. In 1998, Cavalier-Smith published a six-kingdom model, which has been revised in subsequent papers. The version published in 2009 is shown below. (Compared to the version he published in 2004, the alveolates and the rhizarians have been moved from Kingdom Protozoa to Kingdom Chromista.) Cavalier-Smith no longer accepts the importance of the fundamental eubacteria–archaebacteria divide put forward by Woese and others and supported by recent research. His Kingdom Bacteria includes Archaebacteria as a phylum of the subkingdom Unibacteria which comprises only one other phylum: the Posibacteria. The two subkingdoms Unibacteria and Negibacteria of kingdom Bacteria (sole kingdom of empire Prokaryota) are opposed according to their membrane topologies. The bimembranous-unimembranous transition is thought to be far more fundamental than the long branch of genetic distance of Archaebacteria, viewed as having no particular biological significance. Cavalier-Smith does not accept the requirement for taxa to be monophyletic ("holophyletic" in his terminology) to be valid. He defines Prokaryota, Bacteria, Negibacteria, Unibacteria and Posibacteria as valid paraphyletic (therefore "monophyletic" in the sense he uses this term) taxa, marking important innovations of biological significance (in regard of the concept of biological niche). Finally, some protists lacking mitochondria were discovered. As mitochondria were known to be the result of the endosymbiosis of a proteobacterium, it was thought that these amitochondriate eukaryotes were primitively so, marking an important step in eukaryogenesis. As a result, these amitochondriate protists were separated from the protist kingdom, giving rise to the, at the same time, superkingdom and kingdom Archezoa. This was known as the Archezoa hypothesis. This superkingdom was opposed to the Metakaryota superkingdom, grouping together the five other eukaryotic kingdoms (Animalia, Protozoa, Fungi, Plantae and Chromista). Technological advances in electron microscopy allowed the separation of the Chromista from the Plantae kingdom. Indeed, the chloroplast of the chromists is located in the lumen of the endoplasmic reticulum instead of in the cytosol. Moreover, only chromists contain chlorophyll c. Since then, many non-photosynthetic phyla of protists, thought to have secondarily lost their chloroplasts, were integrated into the kingdom Chromista. Thomas Cavalier-Smith thought at first, as it was nearly consensually admitted at that time, that the difference between eubacteria and archaebacteria was so great (particularly considering the genetic distance of ribosomal genes) that they needed to be separated into two different kingdoms, hence splitting the empire Bacteria into two kingdoms. Eubacteria was divided into two subkingdoms: Negibacteria (Gram negative bacteria) and Posibacteria (Gram positive bacteria). This is from Carl Woese's discoveries. Despite the development from two kingdoms to five among most scientists, some authors as late as 1975 continued to employ a traditional two-kingdom system of animals and plants, dividing the plant kingdom into Subkingdoms Prokaryota (bacteria and cyanophytes), Mycota (fungi and supposed relatives), and Chlorota (algae and land plants). In the Whittaker system, Plantae included some algae. In other systems (e.g., Margulis system), Plantae included just the land plants (Embryophyta). The importance of the distinction between prokaryotes and eukaryotes gradually became apparent. In the 1960s, Stanier and van Niel popularised Édouard Chatton's much earlier proposal to recognise this division in a formal classification. This required the creation, for the first time, of a rank above kingdom, a superkingdom or empire, later called a domain. The development of the eukaryotes). In 1938, Herbert F. Copeland proposed a four-kingdom classification, elevating the protist classes of bacteria (Monera) and blue-green algae (Phycochromacea) to phyla in the novel Kingdom Monera.